Complete view of the Hien. The national marking (red sun) on the surface of the right-hand main wing is reproduced with projected red light. The national marking (red sun) on the right-hand side of the fuselage is reproduced every two minutes by projection mapping. Visible are two traces of the national markings (red sun) on the left-hand side of the fuselage. The larger one is a trace of one painted after the war. The trace of the airframe number “6117” below the supercharger air intake. 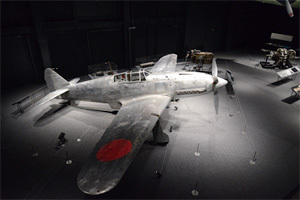 The Kawasaki Ki-61-II Hien (flying swallow), possessed by the Japan Aeronautic Association, was manufactured at the Gifu Works of Kawasaki Aircraft Co., Ltd. in 1944. When World War II ended in 1945, it belonged to the Air Evaluation Department of the Imperial Japanese Army located at the Fussa Air Base in Tokyo. 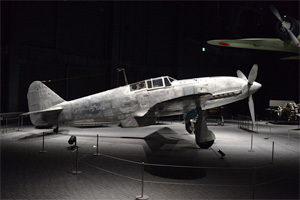 Although almost all Japanese aircraft were scrapped after the war, this fighter was not disposed of for some unknown reason and had been displayed at the US Yokota Air Base until 1953. This Hien is now the world’s only airframe displayed in a museum. (There have been several attempts to restore the Hien, using the wreckage retrieved from New Guinea.) This fighter was transferred to The Japan Aeronautic Association from the US forces for free in 1953. 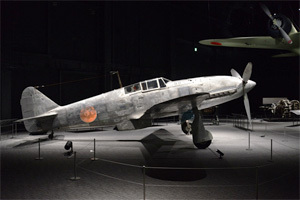 Until 1986, when it was exhibited in the Chiran Peace Museum (Minamikyushu City), the fighter was displayed all over Japan. Meanwhile, some of its parts were lost and the airframe was damaged. When necessary, temporary repairs were carried out while painting and marking distinctly different from the original ones were applied from 1965 onwards. 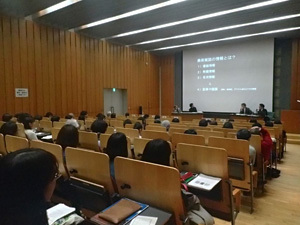 In recent years, the Japan Aeronautic Association has begun to recognize anew the Hien as a cultural property through joint research with the Center for Conservation Science. Kawasaki Heavy Industries, Ltd. (hereinafter KHI) offered full cooperation in restoration of the Hien as a commemorative project to celebrate the 120th anniversary of its foundation in 2016. In 2015, the fighter was restored at its Gifu Works for almost a year. Prior to its restoration, it was decided that the Hien would be restored as a cultural property through negotiation between the Japan Aeronautic Association and KHI. As for individual items for restoration, KHI proposed restoration methods, which the Association checked and accepted. The restoration by KHI covered a wide range of issues, including the removal of the paint applied on the airframe surface, removal of non-original parts added after the war, and production of new replica parts such as the nose panel above the engine and the instrument panels of the cockpit. 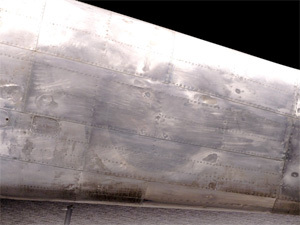 Removal of the paint on the airframe surface revealed the traces of the drilling tool blade that slid over the skin of the wings during manufacture, as well as traces of national markings and caution notes on various parts of the airframe. 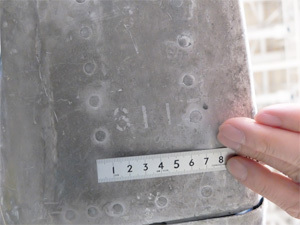 It also revealed the fact that the airframe number (construction number) was “6117.” Repainting of the national markings, which was proposed by KHI, was not implemented due to a possibility that new paint might affect the airframe surface and for the value of exhibiting the discovered traces as they are. When the Hien was exhibited at Kobe Port Terminal Hall (Kobe City) for about one month in autumn 2016, the national markings were reproduced with wrapping film at the request of KHI. 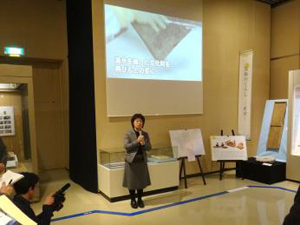 The film was peeled off after being delivered to the Kakamigahara Aerospace Science Museum (Kakamigahara City). Although the museum had been closed since September 2016 for renovation, the disassembled Hien was displayed in the repository from November 2016 through November 2017. 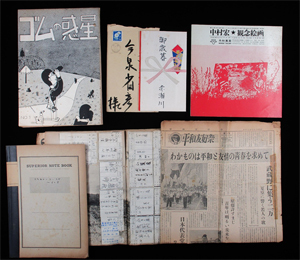 After the restoration by KHI, the Japan Aeronautic Association surveyed the Hien under the supervision of the Center. This led to the removal of deteriorated rubber parts and the replacement of the fabric on the control surfaces (the rudder, the elevators, and the ailerons). Like many other aircraft of that time, the control surfaces are composed of a metal framework covered with fabric. When the fabric was replaced in 1986, it was not sewed to ribs, which resulted in creating a different appearance. Therefore, the Center researched the material of the fabric used in the WW2 era so as to provide supporting data for replacement of the fabric. This replacement was carried out from autumn 2017 through February 2018. The Center also took photos of the airframe before and after the reassembly for the record. When the Museum was reopened after the renewal as “Gifu-Kakamigahara Air and Space Museum” on March 24th, 2018, the Hien became one of the main exhibits there. According to the Museum, many visitors positively accept the unpainted national markings, and this fact indicates that the perception of aircraft as cultural property is spreading in our society. 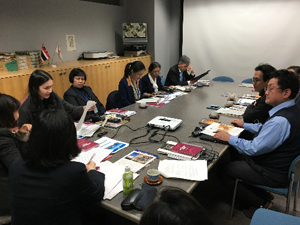 Tokyo National Research Institute for Cultural Properties has been engaged in technical cooperation with the Authority for the Protection and Management of Angkor and the Region of Siem Reap (APSARA) in order to draft a conservation and management plan for Ta Nei Temple in Cambodia. From March 8th through 22nd, 2018, we conducted the third archaeological investigation at Ta Nei Temple and a precise survey of its surroundings. 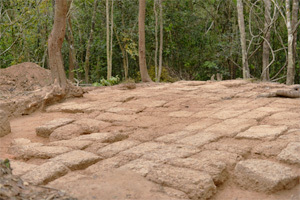 The main purpose of the archaeological investigation was to further clarify the terrace structure on the upper surface of the embankment of the East Baray reservoir discovered during the second investigation in December 2017. The excavation was conducted jointly with staff from APSARA. The investigation disclosed the fact that laterite ashlars are laid to shape the entire structure as a cross, which is 13.8 m east to west and 11.9 m north to south. In addition, numerous roof tiles were found in its vicinity, and there were many holes and dents on the laterite ashlars, which seem to have been postholes. These findings implicitly show that there once was a wooden building on this terrace structure. 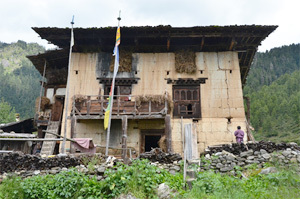 Since the terrace structure is located on the east-west temple axis, we will continue the investigation to clarify the connection between the two structures. 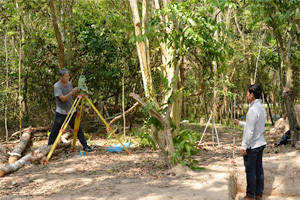 At the same time, we also conducted a precise survey with a total station around the temple. Based on the collected data, we are preparing a detailed topographic map, which is expected to be effectively utilized for the conservation and management of the temple. We also provided technical guidance for APSARA staff through technical transfer during the precise survey. We will continue such technical support, in addition to academic investigations. 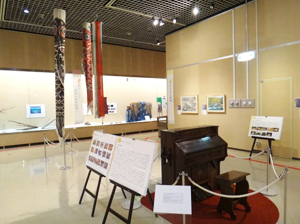 Among overseas art collections, there are numerous Japanese art objects that play a significant role in representing Japanese culture in their regions. However, since the conservators-restorers who are specialized in these objects are rarely overseas and the proper conservation treatment cannot be undertaken on the objects, quite a few objects cannot be shown to the public. 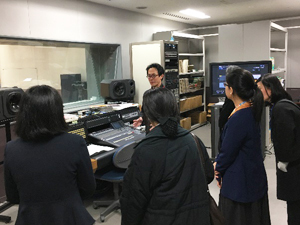 Thus, the Institute conducts the Cooperative Program for the Conservation of Japanese Art Objects Overseas in order to contribute to the conservation-restoration and utilization of these objects. On 26th March, the Institute’s researchers and conservators visited Grassi Museum of Ethnology in Leipzig and investigated the paintings for the purpose of formulating conservation plans and selecting objects for conservation under the Cooperative Program. 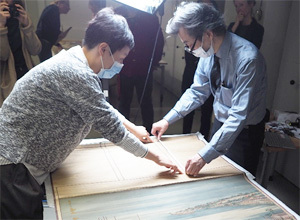 Two hanging scrolls and a pair of folding screens, which had been chosen based on the collection survey conducted last year, were observed to record their components and conditions in detail. After the investigation, we consulted with the Museum about future conservation plans by explaining the conditions of each object as well as details about the Cooperative Program. 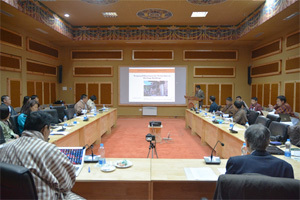 Moreover, there was also a discussion on the possibility of future cooperation in the techniques of conservation of painting in each country such as an exhibition of techniques seen from ethnologic perspectives.